The following are the baseball events of the year 1961 throughout the world. January 29 – Billy Hamilton and Max Carey are voted into the Hall of Fame by the Veterans Committee. February 7 – Boston Red Sox outfielder Jackie Jensen makes a return to the major leagues by signing a $40,000 contract. Jensen had retired in 1960 due to a fear of flying. Jensen will hit .263 with 13 home runs in 1961. March – The Cuban government, led by Fidel Castro, abolishes professional baseball and ends the Cuban League, which was started in 1878, and the Serie Nacional de Béisbol is established. March 6 – The New York Metropolitan Baseball Club Inc. formally receives a certificate of membership from National League President Warren Giles. April 10 — In the traditional "Presidential Opener" in Washington, D.C., the Chicago White Sox defeat the Washington Senators, 4–3, with John F. Kennedy throwing out the first pitch before a crowd of 26,725. The Senators are an expansion team created expressly to replace the preceding team of the same name that moved to Minneapolis–Saint Paul over the winter. The 1961 season is the first of the expansion era, and this Presidential Opener is the last in the history of Griffith Stadium, Washington's venerable baseball park. At Fenway Park, Boston Red Sox rookie Carl Yastrzemski gets a hit off Ray Herbert of the Kansas City Athletics. It is the first of 3,318 hits that Yastrzemski will amass over an illustrious 23-year career. The Los Angeles Angels play the first game in franchise history, defeating the Baltimore Orioles team, 7–2. For the Angels, Ted Kluszewski hits two home runs while Eli Grba pitches a complete game. At Yankee Stadium, the Minnesota Twins shut out the New York Yankees, 6–0, in their first game since their move from Washington, D.C. Pedro Ramos is the winning pitcher, helping himself with a two-run single while allowing just three singles in beating Yankees starter, Whitey Ford. Philadelphia Phillies pitcher Robin Roberts ties Grover Cleveland Alexander's National League record with a 12th-straight Opening Day start‚ but Philadelphia loses 6–2 to Don Drysdale and the Los Angeles Dodgers. Roberts is now 5-6 on Opening Day. April 21 – The Minnesota Twins play their very first home game in franchise history, losing to the Washington Senators 5–3. April 22 – The Boston Red Sox snap a 13-game losing streak in Chicago's Comiskey Park by edging the Chicago White Sox 7–6 on Pumpsie Green's 11th-inning home run. April 27 – The Los Angeles Angels drew a crowd of 11,931 for their home opener against the Minnesota Twins at Los Angeles' Wrigley Field. Ty Cobb, in his last appearance at a ball park, throws out the ceremonial first pitch. Minnesota starter Camilo Pascual spoils the opener by winning, 4–2, sending the Angels to their eighth loss in nine games. April 30 – San Francisco Giants slugger Willie Mays became the ninth player to hit four home runs in a single game as the Giants beat the Milwaukee Braves, 14–4, at Milwaukee's County Stadium. 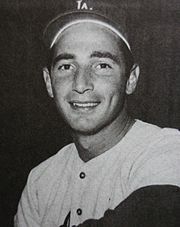 May 9 – The Baltimore Orioles' Jim Gentile hits a grand slam in both the first and second innings in a game against the Minnesota Twins, and finishes with nine RBI in the game. May 31 – Boston Red Sox outfielder Carroll Hardy pinch-hits for rookie Carl Yastrzemski. On September 20, 1960, Hardy pinch hit for Ted Williams, making him the only player to go in for both future Hall of Famers. Hardy also hit his first major league home run pinch-hitting for Roger Maris when both were at Cleveland (May 18, 1958). June 29 – Willie Mays hits 3 home runs helping the San Francisco Giants beat the Philadelphia Phillies 8-7. Willie Mays hits his 300th career home run off pitcher Jack Curtis, leading the San Francisco Giants to a 4–1 victory over the Chicago Cubs at Wrigley Field. In the first game of an Independence Day double-header at Metropolitan Stadium, Minnesota Twins pinch-hitter Julio Bécquer hits the first recorded ever four-pitcher walk-off grand slam in Major League Baseball history. Chicago White Sox starter Billy Pierce, up 4–2 in the ninth inning en route to a complete game, allows a single to Bob Allison. As a result, Pierce is relieved by Russ Kemmerer, who allows other single to Earl Battey. Frank Baumann then is brought in and he walks Lenny Green to load the bases. Afterwards, White Sox manager Al López summons Warren Hacker from the bullpen while Twins manager Sam Mele counters with Bécquer, who puts the ball over the right field fence for the walk-off homer and a 6–4 victory. In the second game of the double-header, Minnesota Twins slugger Harmon Killebrew hits a three-run home run, which will be the only inside-the-park home run of the 573 homers he will hit in his distinguished career. July 11 – Strong winds at Candlestick Park dominate the first All-Star Game of the season. A capacity crowd sees pitcher Stu Miller blown off the mound in the ninth inning resulting in balk being called, and it enables the American League to forge a 3–3 tie before losing 5–4 in 10 innings. July 17 – Commissioner Ford Frick decrees that Babe Ruth's record of 60 home runs in a 154-game schedule in 1927 "cannot be broken unless some batter hits 61 or more within his club's first 154 games." Two days later, Frick, an old friend of Ruth, announces that should Ruth's record be beaten after 154 games, the record will carry an asterisk. When asked about the ruling, Roger Maris replies, "A season is a season." July 31 – At Fenway Park, the second All-Star Game of the year ends in a 1–1 tie as heavy rain halted play. It is the first tie in All-Star history. August 11 – Warren Spahn of the Milwaukee Braves records his 300th career win. August 20 – The Philadelphia Phillies snap a modern-day record 23-game losing streak, defeating the Milwaukee Braves 7-4 in the second game of a doubleheader at Milwaukee County Stadium. Phillie pitcher John Buzhardt goes the distance for the victory; he had also been the winning pitcher in the Phillies' last victory prior to the start of the losing streak, on July 28 against the San Francisco Giants. August 20 – Two Minnesota Twins pitchers homer off two Los Angeles Angels pitchers, to become the sixth (and last) pitching duo to homer in the same game. Starter Jack Kralick leads off the third inning with a homer off Jim Donohue, and Al Schroll hits a lead-off homer in the eighth off Art Fowler. August 22 – Roger Maris becomes the first player to hit his 50th home run of the season in the month of August as the Yankees lose to the Los Angeles Angels 4-3. Angels' pitcher Ken McBride tees up the gopher ball in the 6th inning with one on. August 23 – At Crosley Field, the Giants hit five home runs in a 12-run ninth inning, beating the host Cincinnati Reds 14-0. August 24 – Ageless Satchel Paige signs with the Portland Beavers of the Pacific Coast League. in 25 innings for Portland, he will have a 2.88 ERA. September 1 – Paul Richards resigned as manager of the Baltimore Orioles to become the new General Manager of the new Houston National League club. The club would be known as the Houston Colt .45s. Lum Harris takes over as manager of the Orioles. September 2 – Milwaukee Braves manager Chuck Dressen (71–58) is fired and executive vice president Birdie Tebbetts becomes the new Braves manager. September 14 – At Busch Stadium, the St. Louis Cardinals and the Chicago Cubs set a National League record by using 72 players in a double header. The Cardinals prevailed with 37 players and won twice, 8–7 in a regular nine-inning game and then 6–5 in 11 innings. St. Louis' Ken Boyer posted a 7-for-11 day, hitting for the cycle in the nitecap and completing it by belting a walk-off home run in the bottom of the 11th. The Cincinnati Reds clinch their first National League pennant since 1940. Home runs by OF Frank Robinson and pinch hitter Jerry Lynch (a tie breaker in the 8th inning) give the Reds an 8–3 win over the Chicago Cubs at Wrigley Field. October 1 – Before a small crowd at Yankee Stadium, New York Yankees outfielder Roger Maris smacks a 2–0 pitch into right field for his 61st home run of the season (a record that would last until Mark McGwire broke it in 1998). The home run is number 240 for the Yankees, which sets a major league single-season record. October 9 – In Game Five of the World Series, Johnny Blanchard and Héctor López spark a five-run first inning and 13–5 win for the New York Yankees over the Cincinnati Reds. Blanchard and López hit home runs, and López drives in five runs. Bud Daley's long relief effort wraps up the Series, as Ralph Houk becomes the third rookie manager to guide a World Series winner. Whitey Ford is named the Series MVP. November 16 – The New York Mets logo, designed by sports cartoonist Ray Gatto, is unveiled. The insignia, which is round with orange stitching, represents a baseball. A bridge in the foreground symbolizes that the Mets, in bringing back the National League to New York, represent all five boroughs. The skyline in the background includes a church spire, symbolic of Brooklyn, the Williamsburg Savings Bank, the Woolworth Building, the Empire State Building and the United Nations Building. The Mets' colors are Dodger blue and Giant orange, symbolic of the return of National League baseball to New York after the Dodgers and Giants moved to California. November 22 – Frank Robinson becomes the first Cincinnati Reds player in 21 years to win the National League MVP Award, taking 219 of 224 possible votes. November 26 – The Professional Baseball Rules Committee votes 8–1 against legalizing the spitball. Only National League supervisor of umpires Cal Hubbard votes in favor. November 27 – The Chicago White Sox again trade Chicago fan-favorite Minnie Miñoso, this time to the St. Louis Cardinals in exchange for OF/1B Joe Cunningham. November 30 – Chicago Cubs outfielder Billy Williams, who hit .278 with 25 home runs and 86 RBI, is selected as the National League Rookie of the Year. Catcher Joe Torre of the Milwaukee Braves (.278, 10, 42) and Cubs pitcher Jack Curtis (10 wins, 4.89 ERA) also receive consideration for the honor. December 2 – MLB clubs vote to curb bonuses. All first-year players not on major rosters, except one minor leaguer, can be drafted by any other club for $8,000. Clubs are expected to be unwilling to pay large bonuses for players who will be subject to a draft for just $8,000. May 17 – Otto Knabe, 76, Second baseman for the Philadelphia Phillies for many years, and was the player-manager for the Baltimore Terrapins of the Federal League. August 3 – Tom Downey, 77, played from 1909 to 1915 for the Reds, Phillies, Cubs, and Bisons.